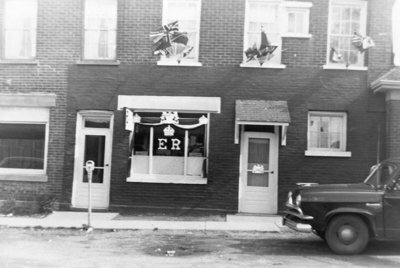 Black and white negative showing a store decorated for the Coronation of Queen Elizabeth II. Munns Press was located at 105 Colborne Street West, on the south side of Colborne Street west of Brock Street. Munns Press was owned by George Munns. Union Jack flags hang from the windows and the letters ER appear on the door. Coronation Decorations, 1953, George Munns, Whitby Archives, 30-009-005.